Although the sea is a source of great wealth for Africa, piracy, narcotics trafficking, arms smuggling, and other transnational threats present a significant threat to the continent’s security, jobs, food supply, and trade. The Africa Center for Strategic Studies has compiled a collection of analyses, research, and lectures that present challenges of and methods for securing the maritime domain. Africa Center Professor of Defense Economics and Resource Management Assis Malaquias discusses insecurity, piracy, illegal fishing, and other maritime threats at a workshop on Africa’s Contemporary Security Challenges hosted by the Africa Center for Strategic Studies in December 2016. This toolkit is intended to assist policymakers and practitioners as they navigate the process of developing maritime national security strategies in Africa. Assis Malaquias, Professor and Academic Chair, Defense Economics and Resource Management at the Africa Center for Strategic Studies, discusses maritime security at the African Center’s Senior Leaders Seminar in May 2016. Ian Ralby, Adjunct Professor of Maritime Law and Security at the Africa Center for Strategic Studies, goes beyond a conceptual discussion of maritime issues to analyze specific examples of threat trends in North, East, and West Africa and the process and results of the international response at the African Center’s Senior Leaders Seminar in May 2016. Africa’s 16,000-mile coastline gives two-thirds of its countries direct access to a sea of riches. The maritime domain offers enormous earning potential through fishing and tourism. It serves as a major cultural reference point and a vital source of livelihoods for both coastal and inland communities. Assis Malaquias, Professor and Academic Chair, Defense Economics and Resource Management at the Africa Center for Strategic Studies, discusses maritime security at the African Center’s Next Generation of African Security Sector Leaders program in October 2015. The U.S. Department of State has honored the Africa Center’s Dr. Assis Malaquias with an award recognizing his unique contributions in advancing maritime security efforts in Africa. Dr. Malaquias has been leading the Africa Center’s maritime security portfolio since 2009. One fundamental security challenge Nigeria’s leaders must face lies at sea because he security of the Gulf of Guinea is integral to the country’s economic health. “Maritime security is an integral part of a nation’s overall economic performance,” maritime security expert Loïc Moudouma said in a seminar held at the Africa Center for Strategic Studies. He was speaking to a gathering of senior U.S. officials, academics and researchers and members of the African diplomatic corps. A growing number of Africa’s security challenges—narcotics trafficking, piracy, illegal fishing, and armed robberies, among others—take place at sea. 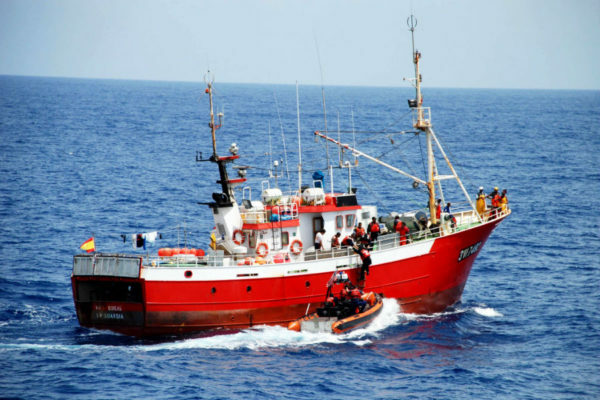 Illicit actors exploit Africa’s maritime space given its expansiveness and the limited number of vessels African governments can field to interdict this activity. Technology can dramatically improve Africa’s maritime security coverage.